If teachers at Cannon County High School feel like they have double vision at times, there is a reason. Having twins within a school is not a rarity and multiples within a system really isn't extraordinary; however, Cannon County High School does have somewhat of a unique situation. Cannon County High School has 10 sets of twins and one set of quadruplets among its nearly 700 students this 2012-13 school year. "Schools have twins and multiple sets of twins but it is unique to have 10 sets of twins, and we also have quads," said Cindy Taylor, attendance clerk at CCHS. "It is kind of neat. I knew we had several twins but when you put it all into perspective it's interesting to have that many at one time." The quadruplets are Erin, Garrett, Kristen and Marshall McReynolds. The 10 sets of twins are Katie and Sarah Hickman, David and Katie Parrott, Dustin and Terra Burgess, Hannah and Rachel Pate, Brent and Brian Duggin, Kody and Kyle Margarito, David and John Frazier, Christin and Nathan Blair, Lacy and Tracy Whiting and Natasha and Ashley Bynum. While the siblings admit they are protective of one another, they also prefer some individuality when it comes to school - and holidays. "It's easier to share with others than my sister," David Parrott jokes. "It is hard to get recognized as an individual because everyone knows you have a twin. You have to share your birthday. There are lots of things people don't think about." Of course, it's easy to tell the Parrott twins apart because they are fraternal. That doesn't mean they aren't protective. "I would kill or be killed for David," Katie says. "Having a twin is good because it's a person that understands and looks after you no matter what. You are never alone because you have someone around that understands you. Our personalities are completely different but we have a lot of similar interests too." The Duggins are identical twins but there are differences between them. "We definitely have different personalities and different things make us mad," Brian says. "It's nice having a twin though because most people don't' get to experience it. Brent and I disagree a lot but we share most things. We generally get treated as one. I would say I'm very protective of Brent. If something hurts him or bothers him it does me too." Brent says he agrees with Brent's assessment of their relationship. "Like most brothers, we do argue at times, but we take care of one another," Brent said. "We have our own ideas and thoughts at times but we also like and do similar things. We are together most all of the time so you really never get bored." Most of the twins said they are alike within even if there are differences on the outside. The greatest attribute they share is love for one another and a protective attitude. 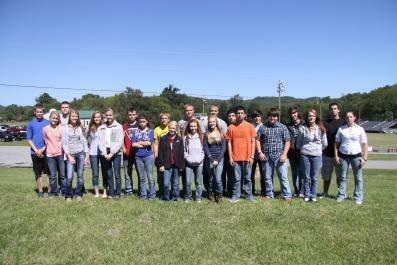 Cannon County has many outstanding students but it also has 24 siblings who share a bond much closer than others. These twins are similar yet unique in ways that make them individuals that share a special bond.